We are happy to announce that we have released the PRO version of Prevent Content Theft WordPress Plugin which offers more advanced features to prevent copying of your valuable content and images. Prevent Content Theft PRO WordPress Plugin which was formerly known as Disable Right Click plugin comes with a set of additional features and enhancements that surely helps to decrease or avoid content theft and plagiarism and protect your content from being copied. Here are the new features of Prevent Content Theft PRO. The PRO version uses a beautiful animated alert box to show the disable notice, the alert box automatically hides after a few seconds to avoid disturbance for your visitor. In the PRO version you can restrict cut (ctrl+x) and copy (ctrl+c) shortcut keys to protect your content from being copied directly. It also restricts the Save (ctrl+s) shortcut key. The PRO version let you disable the selection of text and image as well as image drag-n-drop functionalities which makes it difficult to copy your text and images. Want to enable right click for some pages? 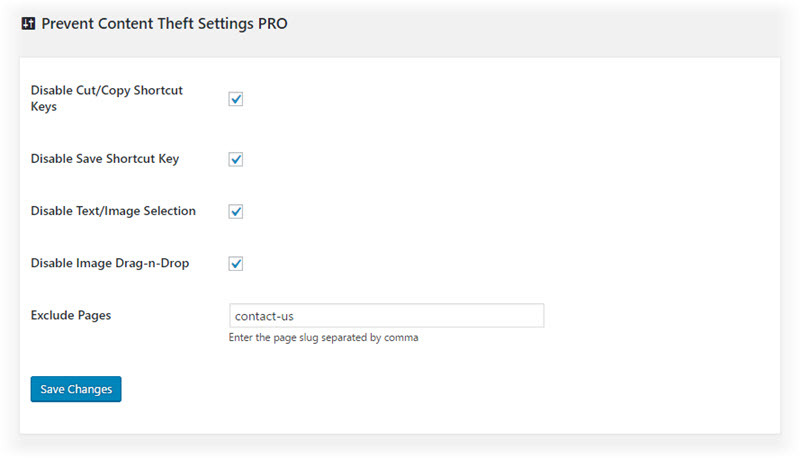 You can exclude pages in the PRO version to allow right click context menu on the pages you want.